The 3D Touch display on iPhone 6s and iPhone 6s Plus is able to detect pressure applied to the screen in order to serve the 3D Touch pop and peek functions, but with the help of a little third party web app you can transform the iPhone and 3D Touch display into a fairly precise scale. You’ll find the results are quite accurate as long as you’re delicate, and the weight measurement is offered down to hundredths of a gram all the way up to 385 grams, the maximum amount of weight it can detect. * For best results, find a spoon that is somewhat flat on the bottom so that it doesn’t roll around or move much. 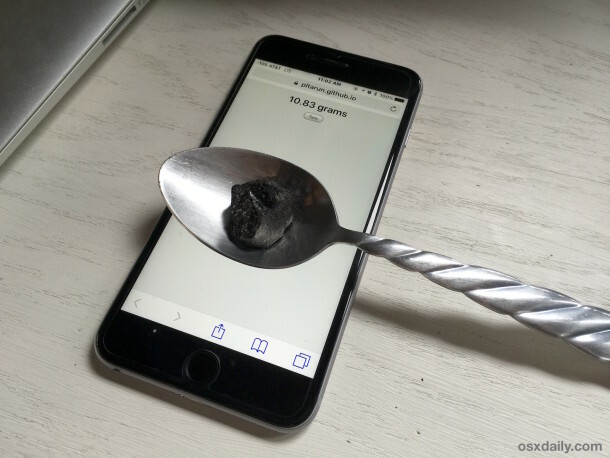 Also, be as delicate as possible when placing items into the spoon to weigh, if the spoon moves at all or rolls around, you’ll quickly discover the weight of the spoon becomes included in the weight of the item and the measurement is way off. You need to use a metal item so that it is conductive, things like plastic, wood, cloth, and paper won’t register on the touch screen. If you have adjusted your 3D Touch screen sensitivity settings you may find the screen is a little more or less sensitive to this app, so consider changing it to the middle setting if it’s all over the place. This is a fun proof of concept but it can be a little finicky, so you probably shouldn’t plan on using this for anything serious, whether in the kitchen as it could likely botch a recipe (it said 2 grams of jalapeno powder, I swear! ), and especially so if you’re trying to be a Walter White or Pablo Escobar. Anyway, since there are no downloads required and it’s as easy as loading a web page onto the iPhone, it’s fun to play around with. 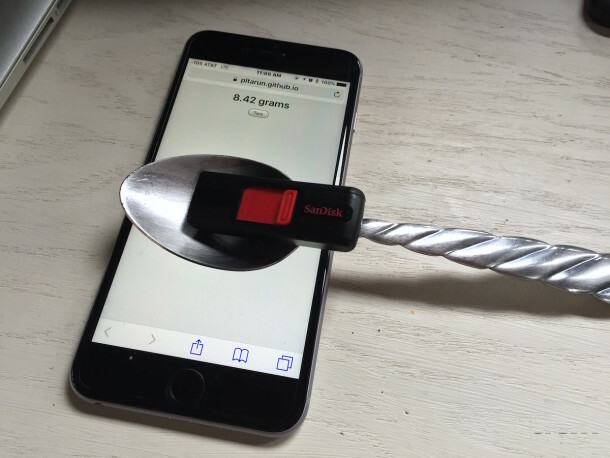 Finally, your iPhone can weigh your …. french fries …. to be sure they are accurately weighed and you are getting your moneys worth. Unfortunately, if you have one of those stiff glass screens protecting your phone screen, this trick won’t work, even at the light setting. Perhaps you could use it to weigh mail to see if extra postage is required? Somehow is the sensitivity different depending on the object. Haven’t tried a spoon yet, but with a glass light bulb I get no weight reading no matter if I press further on the bulb. On the other side with my finger I can get readings from about 1 gram to 385 grams. Could it be, that 3D touch has to first detect that something is actually touching the screen to start working? In a way to prevent 3D-Touch to drain your batteries while the phone is somewhere below a pile of books !!! It has nothing to do with the weight, it must conduct electricity. The touch screen of iPhones requires that something capacitive (conducting) is touching the screen to activate, which is why a light bulb, glass, plastic, wood, paper, etc won’t register anything regardless of pressure or weight, but your skin and metal, or a stylus built for the purpose, does work to activate the touch screen. This carries over to the scale as well and 3d Touch as well. The same with all touch screens, that’s just how they work, they detect the subtle electrical current. Pedantic alert: not all touch screens work this way. You’re describing capacitive touch screens, that measure electrical interference on an invisible grid on your screen. The old kind that you needed to push on were called resistive, where you had to physically push on the screen enough to make two parts touch (normally the screen layers was held apart by microscopic clear beads or a gel. the latter were my favorite for typing on the smart phone by far. it was like a key press with that click feeling it gave. makes me hot just reminiscin about it. Do one have to use a spoon? ZOMG Paul’s gonna do ten grams of heroin it seems…with his snazzy iScale 6s plus! where do I find the Scale app? This didn’t work for me. I opened the link placed a cup on it and the weight didn’t change. But the weight changed when I laid my finger on it. iPhone screens are sensitive to human touch (heat sensitive) that’s why if you use gloves to type it won’t type and you have to get the special made iPhone gloves to be able to type while wearing gloves. 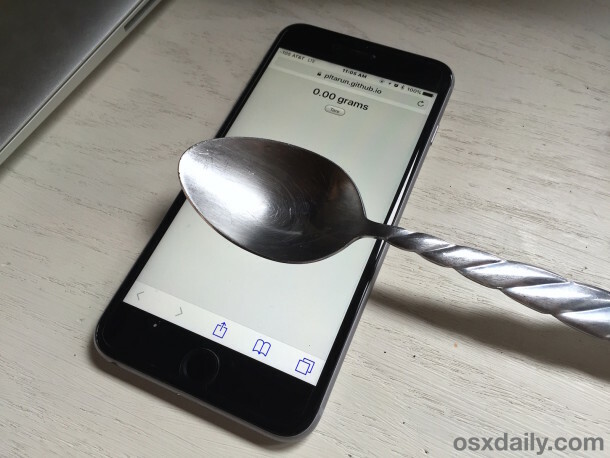 Can you please explain how you were able to place a spoon on the phone without having your finger touch it to have the screen recognize the items weight?